For most people, summer means spending time outside in the sun. But for weirdos like us, all we want to do this time of year is stay inside and read the new comics we picked up from the Chicago Alternative Comic Expo (CAKE). 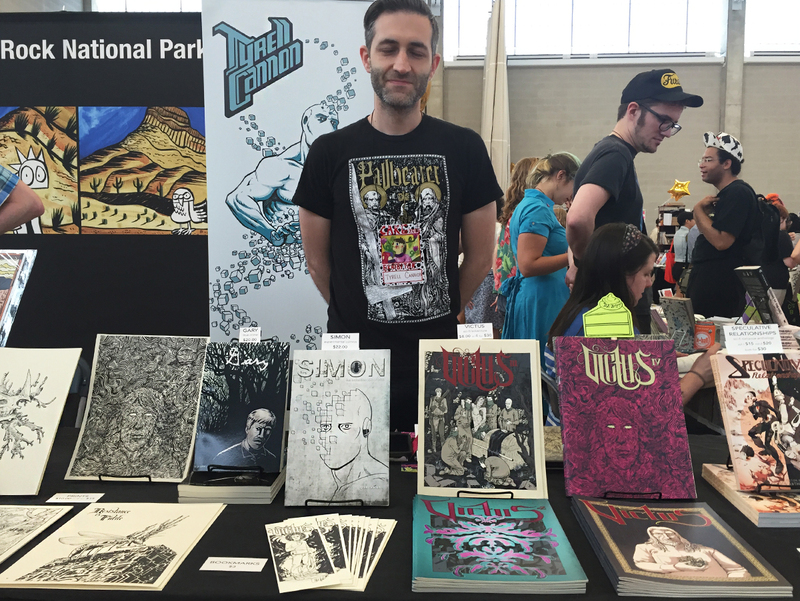 CAKE is the Comic Con of alternative comics, a.k.a the alt comic fan’s Christmas time. Like Comic Con, CAKE is an opportunity to meet your favorite alt comic artists in real life and put a face with the, well, often illustrated version of their face. And much like Christmas time, you end up spending way more money than you or your wallet expected…but hey, it’s supporting artists, damn it! 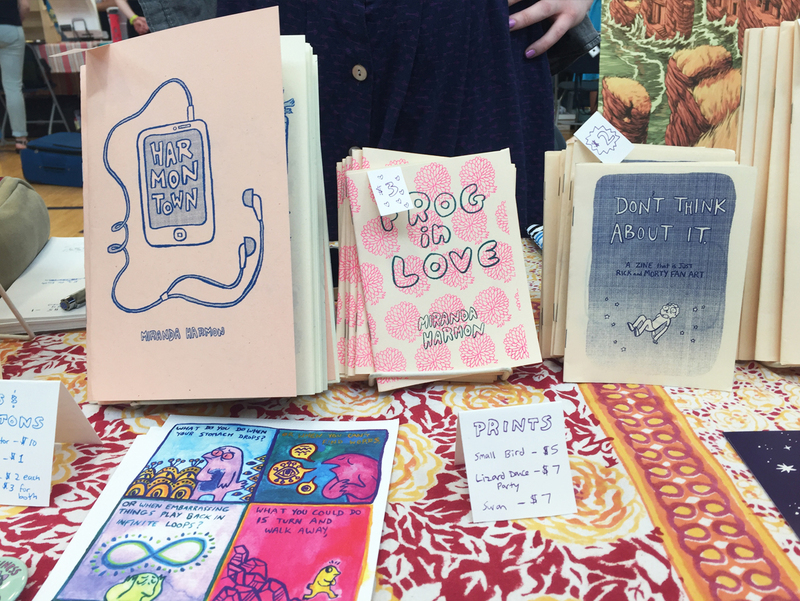 I went to CAKE this year to see some of my favorite zine and comic creators and to discover new ones, and oh man, did I. 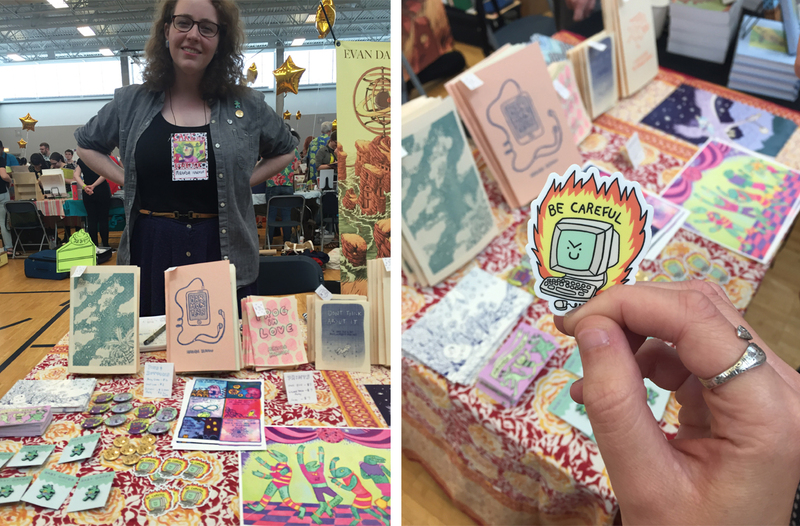 Here are some creatives and comics that caught my eye at CAKE 2016. Tyrell’s beautifully intricate style keeps you fixed on a single drawing, looking for details you might have missed. 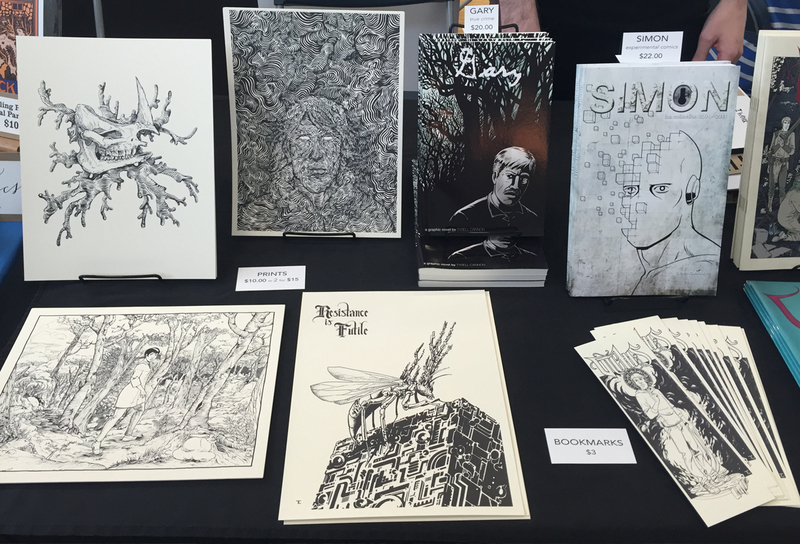 In addition to his illustrations, he made a playlist that goes along with his comic, Victus IV (pictured above on the right), and his Sci-fi anthology Speculative Relationships features work from multiple artists. I mean, if the title, Don’t Think About it: A Zine That is Just Rick and Morty Fanart doesn’t make you an obligatory Miranda fan, you might be in the wrong place. Her work varies from tackling personal issues in Harmontown, and lighter zines like the Rick and Morty fanart and her sketch zine called “Thank You For Joining Me On This Horrible Journey: A Sketch Zine,” that are just pure fun. 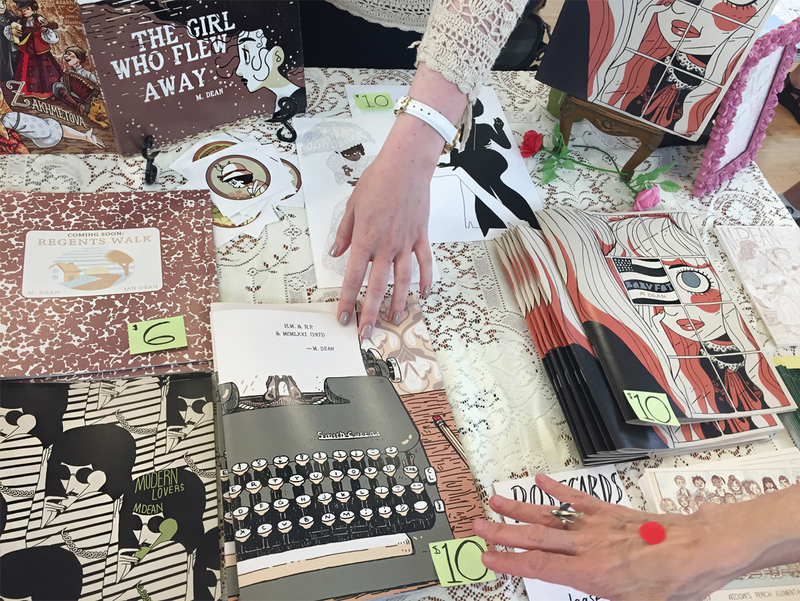 I fell head over heels for her zines. It’s easy to say there’s not enough original sci-fi out there anymore, but there is – you just have to look for it. 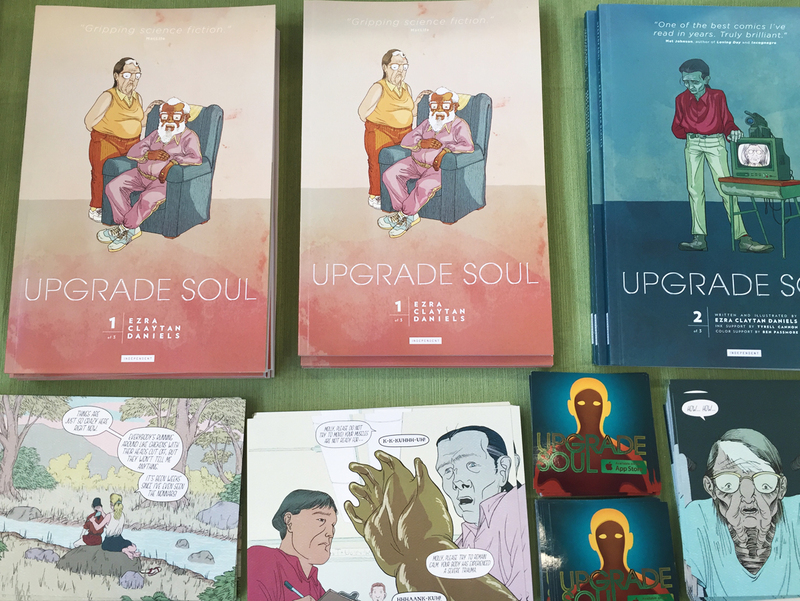 And Upgrade Soul is a beautiful and unique sci-fi story about identity and growing older…and accidental cloning, of course. 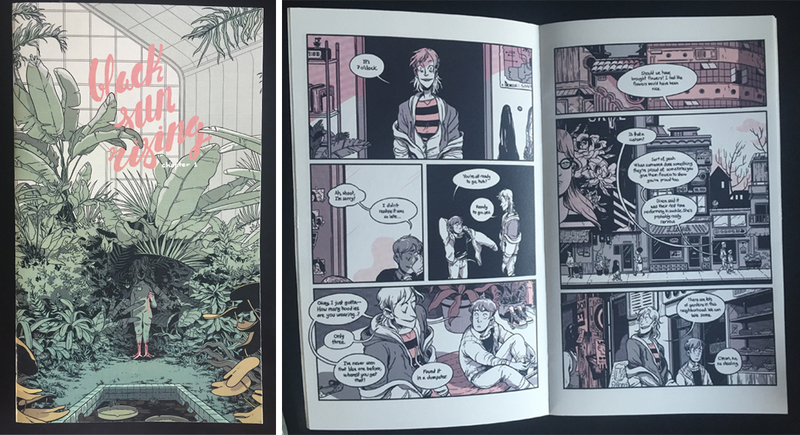 Daniels’ flat color and pastel palette make this comic a visual treat. 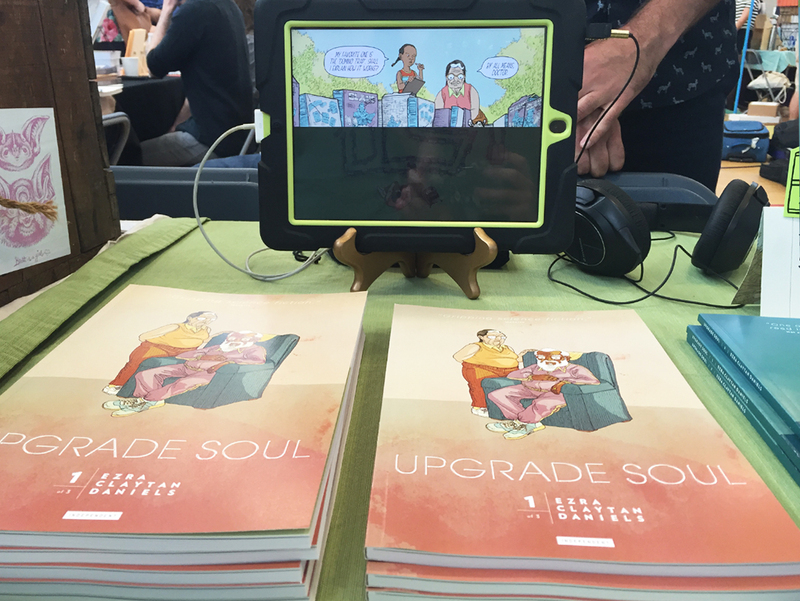 And whaddya know, Upgrade Soul is available as a FREE app in the apple store and comes with its own atmospheric music! There’s something very calming and reflective about O’Connell’s art. 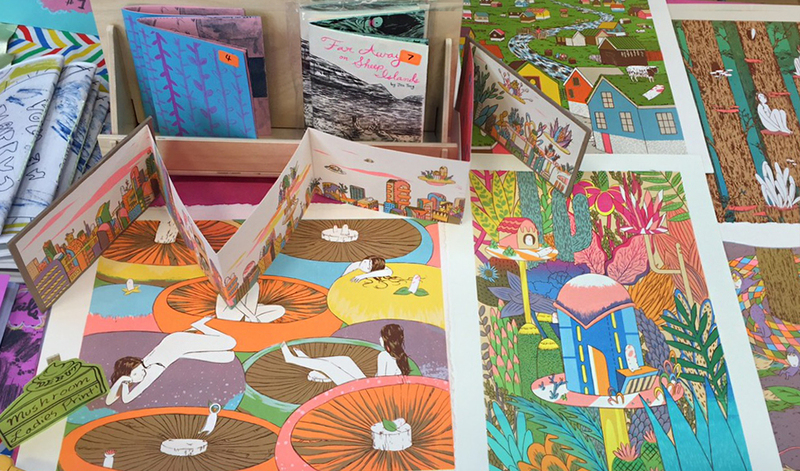 Whether it’s a zine about the growth of a mandrake, or a hot pink print of Santa Barbara palm trees, her use of limited color palettes and flat color makes her art a visual trip. I picked up the limited edition printed first chapter of her comic Black Sun Rising, which made its debut at CAKE this year. Check out more of her incredible work on her website or tumblr. 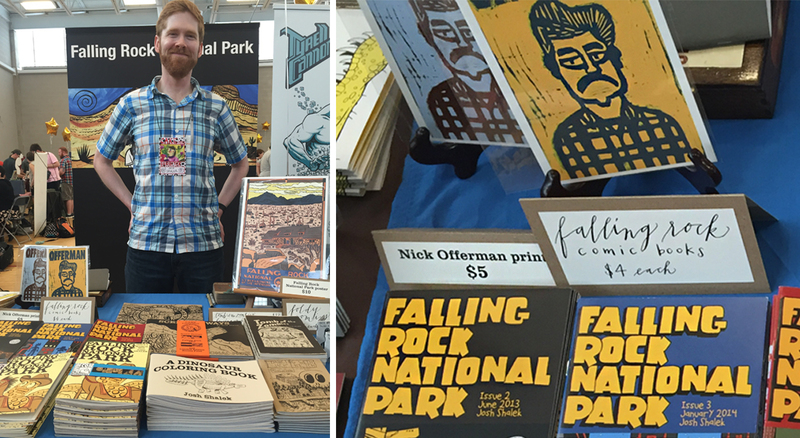 I ran over to Shalek’s booth for the Nick Offerman sketch, stayed to check out his outdoorsy comic, Falling Rock National Park. 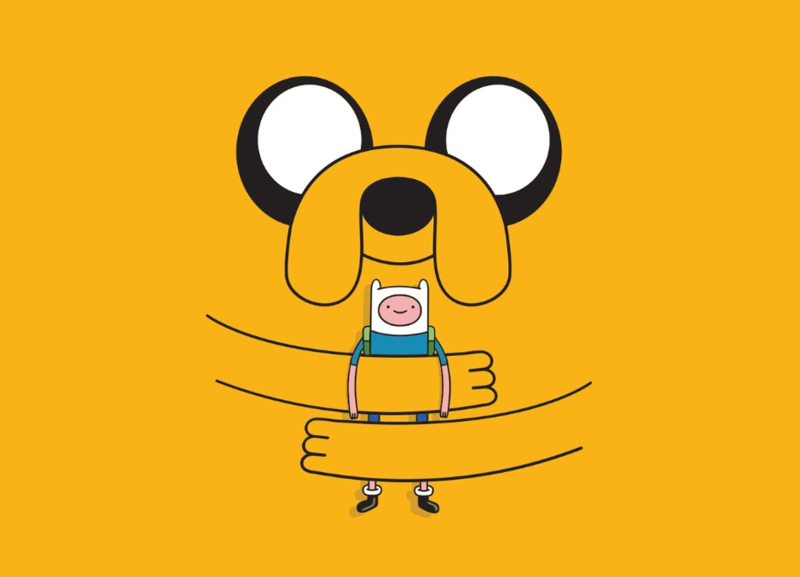 While she’s an illustrator for the Adventure Time comic as well as the Steven Universe comic, it was her comic Truce (click to read it!) that I picked up – a heartwarming story about love and one’s personal identity and anxieties. I lingered at these two tables for a really long time. 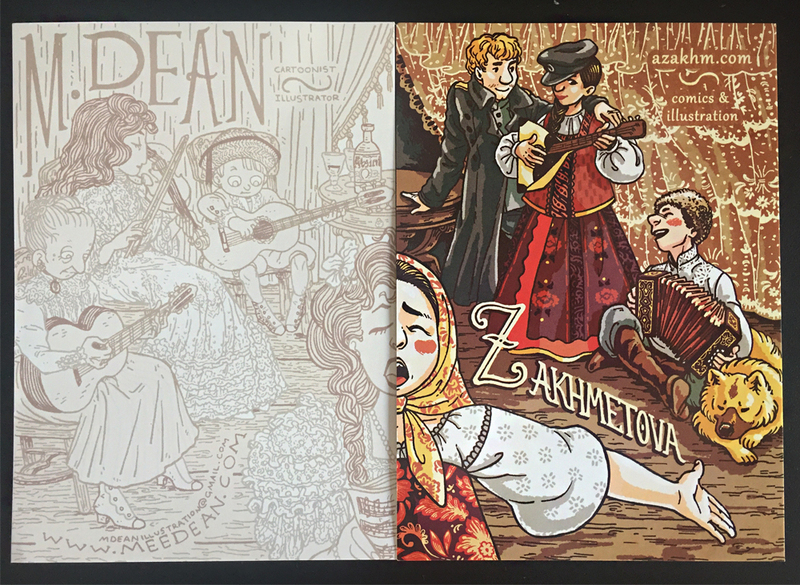 M. Dean’s work and illustration style in particular really drew me in (no pun intended). And Akhmetova’s dark art was mesmerizing. 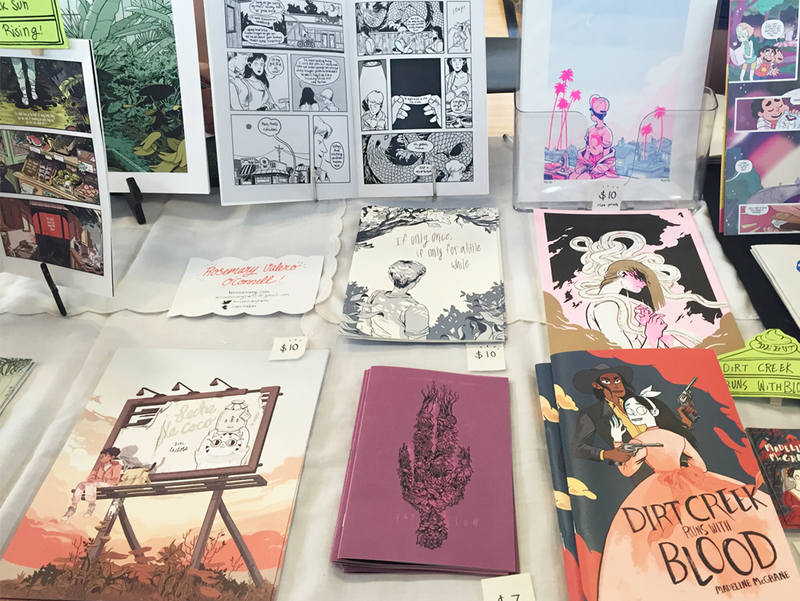 I never knew I wanted a short comic about succulents until I saw Jen Tong’s short comic, In a Succulent Universe. A.k.a my kinda universe. Her candy-colored art is as captivating as it is unique and beautifully detailed. In a crazy, small-world twist, I met a member of the Threadfam – Andrea Bell! 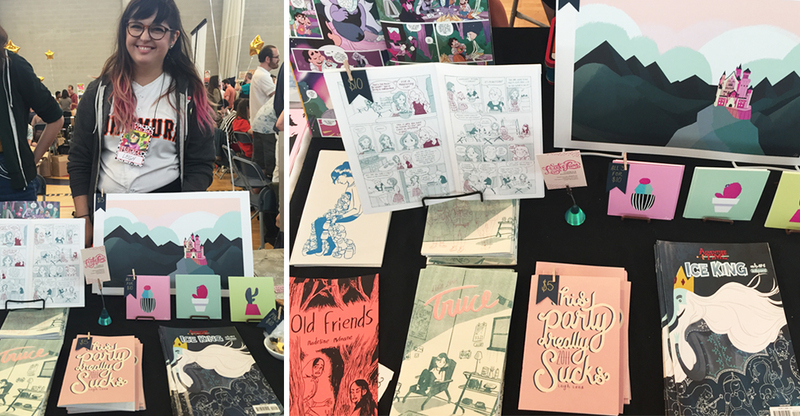 She’s an all-around awesome person, and I was absolutely taken with her awesome art style and color palette reminiscent of Bee and Puppycat. These aren’t comics – she just had some of the most unusual and adorable clay critters I’ve ever seen. That’s the one I adopted on the right. His name is Florf. 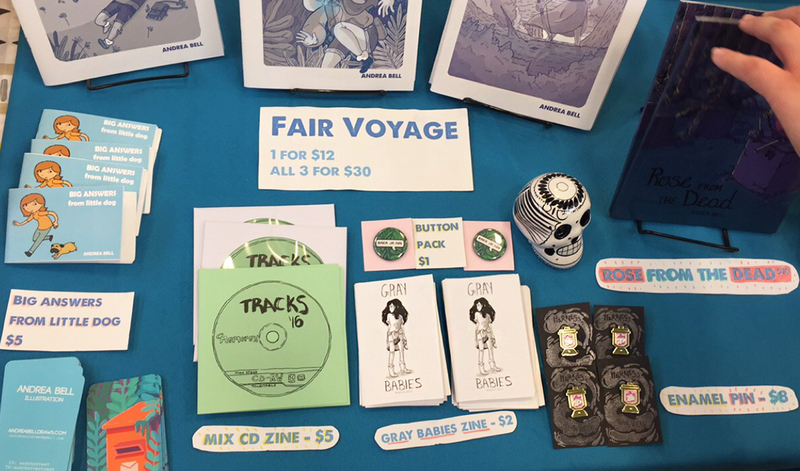 Missed CAKE Chicago 2016? Check out some of the artists who attended right here! Or just click this link for CAKE info. 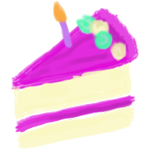 And here’s a drawing of a piece of cake because aren’t you craving some now? 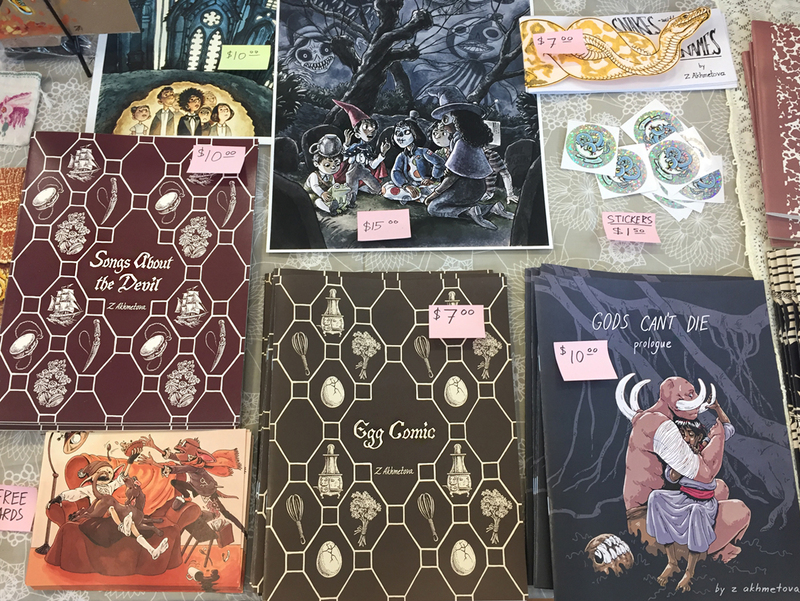 Posted in Blog, Fun Stuff and tagged adventure time, alt comics, cake, chicago alternative comics expo, independent artists, zines. Bookmark the permalink. You’re Hiking in a Mythical Land: What Creature Do You Want to See?